The Arizona Law Enforcement Emerald Society (ALEES) shamrock patch is back in stock at The Irish Gift House. 100% of the proceeds benefit the benevolent works of ALEES which includes assisting the families of fallen officers and first responders. 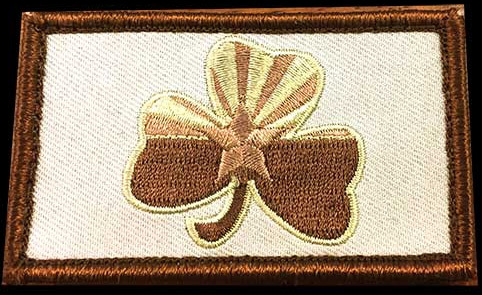 The ALEES patch features an embroidered earth tone design of the Arizona flag inside of a shamrock. 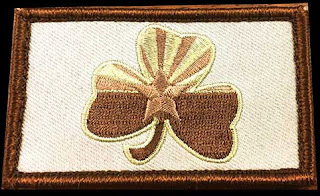 This Irish patch measures 3" wide x 1 3/4" tall and it is two piece military or tactical style design with a Velcro backing. This shamrock patch will look great on caps or clothing along with backpacks and you will be assisting ALEES help the families of fallen first responders in both Arizona and throughout the United States. The ALEES shamrock patch is available from The Irish Gift House for only $6.95 each or for a limited time you may receive one free of charge with any purchase of $99.00 or more. Either way, $6.95 is donated to ALEES for every patch shipped. Additionally, each patch is complete with a shamrock history card that is complements of The Irish Gift House. The ALEES patch is a hot item that is now in its second production run. Through your generosity, The Irish Gift House has raised over $700.00 for ALEES since this promotion started in September, 2017. Through our special promotions and your assistance, The Irish Gift House has donated almost $37,000.00 to ALEES during the past decade. On the ALEES' Facebook page they write, While you are there, give them a good review, they've been backing the blue before it was popular. Arizona Law Enforcement Emerald Society is compromised of Law Enforcement professionals, active and retired, throughout the great State of Arizona. They are part of a nationwide fraternal institution created over 60 years ago to promote a social spirit among police officers of Irish ancestry and those with an Irish spirit. ALEES has evolved into a benevolent organization which, through its Non-Profit Foundation provides immediate financial support to families of law enforcement officers who are killed or seriously injured in the line-of-duty while serving. The Irish Gift House is a mom and pop Irish gift site that is based in Arizona and boasts the largest collection of Irish and Celtic gifts and jewelry in the world.